While on the go, you can easily tell friends where you are, share pictures, get their comments (“I’m right around the corner, I’ll stop by to say hello”), and get insider tips (“order the Lobster Ravioli; it’s the best dish by far.”). Tons of places offer discounts and freebies to foursquare users, and you earn points and badges for doing the things you love. Gowalla is a social travel guide and passport on your phone. It’s a fun and social way to keep up with your friends, record your memories, share photos and highlights, and discover your city and the world around you. Plus, Gowalla is available EVERYWHERE, so you’ll be able to record your adventures wherever you go. Gowalla will even keep track of all the cities, states and countries you visit. With Gowalla you can check in and share your highlights at local eateries, bars, venues, retail stores, boutiques, parks, and more. 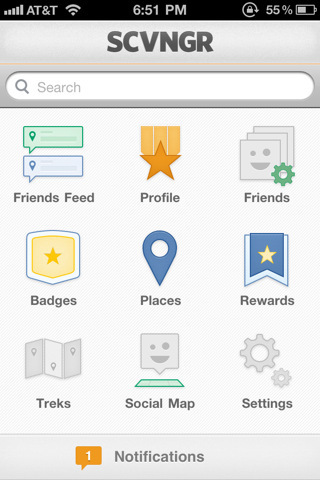 When you do, you’ll pick up unique pins and rewards, adding to your Gowalla Passport along the way. And with our Facebook, Twitter, Foursquare and Tumblr integration, you can share your favorite places and photos with everyone! Google Latitude lets you stay in touch with your friends and family by making it easy to share where you are and see each other on a map. Check in at places to share them with friends, gain status there, and unlock offers where available. SCVNGR is a game about going places, doing challenges and earning points. 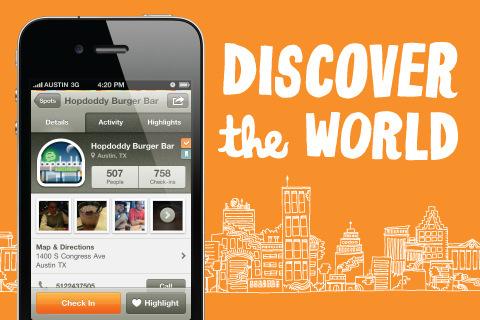 You’ll discover cool new places to go, find fun new things to do and share your activity with your friends. What are you up to? Share it with your friends on Ditto! Exchange recommendations about restaurants, movies, and other activities. Select an icon, ping your friends, and get notified about replies. Simply log in with your Facebook account and start dittoing! 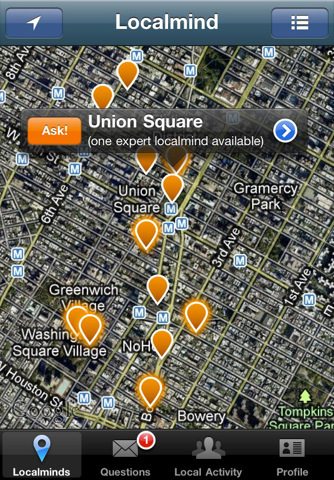 Localmind allows you to ask questions of people checked-in at any location, thus giving you the ability to know what’s happening at this very moment at any place you care about. Find out how crowded the bar is, what specials at the restaurant are, or whether the coffee shop’s wifi is up. Mobile real-time omniscience at your fingertips. atzip is all about getting out. Whatever you’re up for, whether you’re new in town or a regular, atzip connects you to a dynamic network of places and people in-the-know — in and around your ZIP. 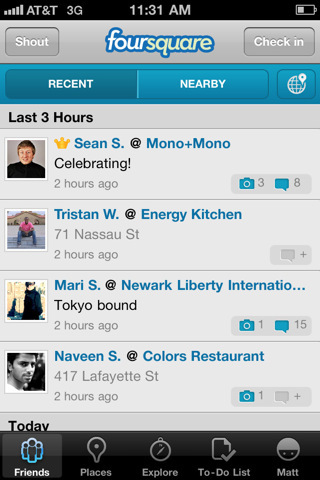 Recco helps friends share their reccos on restaurants, bars, shops and other favorite venues with one another. Capture and keep track of all your go-to places so you don’t forget about them. Have them on-hand anytime you need a place to go. 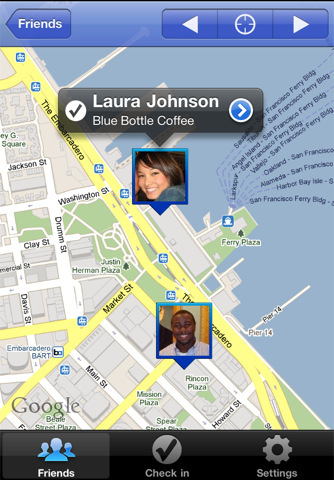 Recco lets you access your friends’ database of reccos, so you can discover new places from people you really trust. Because trusting friends beats trusting strangers. A perfect companion to the Google Latitude app. Ladidude supports various background modes to update your location as you move. 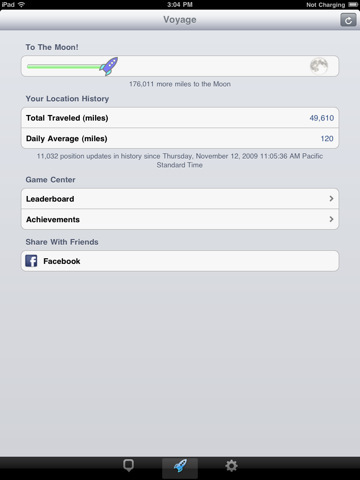 Use your location history to compete with other Google Latitude users worldwide on Game Center! Earn achievements and post to leaderboards without the checkin fatigue. Your progress is cumulative and nothing is dropped. Refresh the Voyage page at your own pace. Continued use of GPS running in the background can dramatically decrease battery life. Ladidude is not affiliated with Google, Inc.
Prowl Owl™ is a geolocation app for the iPhone that sends push alerts when your Facebook friends are nearby. Whether you’re at a park, at a bar, or on campus, Prowl Owl let’s you spend less time pulling out your phone and more time hanging out with friends. – Login to Prowl Owl using your existing Facebook ID. No need to create another new social networking account. – Receive push alerts automatically when Facebook friends enter your geofence. – Adjust your geofence diameter so you and your friends receive push notifications when you’re within a certain distance from each other- anywhere from .1 mile to 1 mile away. – Don’t feel like being found? “Hide” from specific people or your entire network. 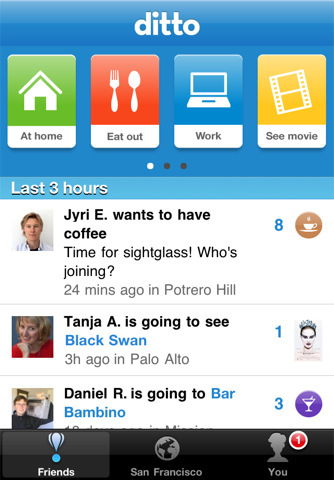 – Update your Facebook status or post on a friends wall from directly within the application. 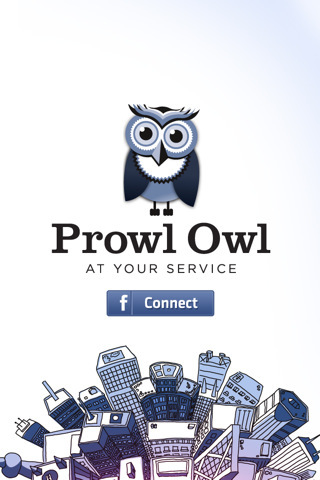 Prowl Owl™ was created for the sole purpose of helping friends connect in the real world without having to constantly monitor their devices. If you have any feedback of questions related to Prowl Owl™, we want to hear from you. Please email us or visit our website for more information.